Batman avoids a gunshot by…running right toward it. Acting as a tie-in to megahit The Dark Knight is this DC animated short film collection, Batman: Gotham Knight, an anthology of six short movies made by highly regarded Japanese animation studios. You’re probably thinking Warner Brothers had done something like this before, and the answer is yes. That project was Animatrix, which tied into the Matrix trilogy. Batman: Gotham Knight is actually supposed to take place in the same continuity as the Nolan Batman films, between Batman Begins and The Dark Knight. Despite that, I felt like Gotham Knight was a welcome change of pace. The first story, “Hey I Got a Story for You” was a Rashomon-esque situation where four kids try to retell their versions of how they saw Batman take a robber down. Animated by Studio 4C, it was easily one of the trippiest experiences I have had in a while with its highly stylized animation style used to compound the children’s stories. It was followed up by Production IG-animated (Production IG is known for projects like Ghost in the Shell) “Crossfire”, where a new Gotham City Police Department detective has his doubts about Batman and how he was aiding the police. What I liked about those two stories was that they explored an area which I feel most other Batman media haven’t, and that is how Gotham City at large perceived the Caped Crusader. The Nolan movies, especially, were almost entirely centered around Bruce Wayne and his alter ego, and it was for that reason I felt those stories were welcome. I also did like how each story, even though Studio 4C and Studio Madhouse each animated two of them, had a distinct feel and animation style I have to admit what was a little odd was how Bee Train, known for Noir, made “Field Test” look more like what one would expect anime to look like. It was a little jarring for me to hear the voice of Kevin Conroy (WB’s designated Batman/Bruce Wayne voice actor, who has been in this role since the phenomenally successful Batman: The Animated Series) coming out of Bruce Wayne’s bishounen character model. While my least favorite segment was the last one, “Deadshot”, as it felt more like a run-of-the-mill Batman story, I think the real highlight was “Working Through Pain”. Despite the fact that it was also animated by Studio 4C, it was a much darker, more realistic product. We see Batman has sustained a gunshot wound while chasing a criminal in the sewer system. As he awaits rescue from Alfred, we see Batman reflect on a time when he was still simply Bruce Wayne as he went to India to learn to control his pain. Of the six pieces, “Working Through Pain” was probably the least action-packed, and it resulted in being what I think is the most poignant one. I felt like this poignancy was what made Batman: Gotham Knight a real winner for me. 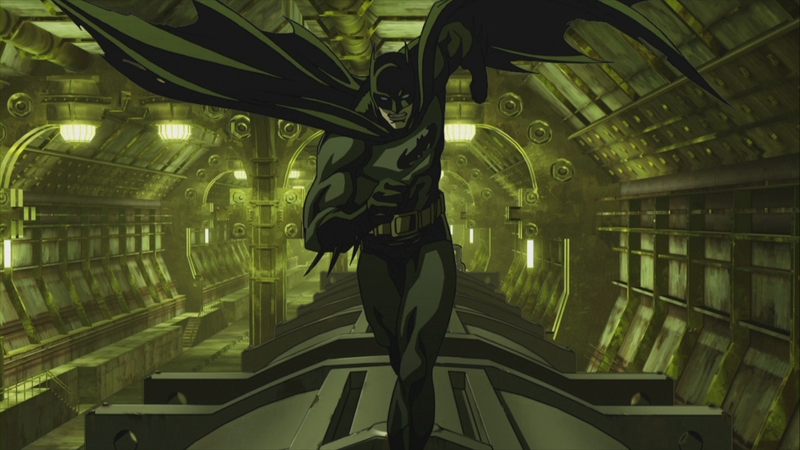 Even though it advertised itself as a tie-in to the Nolan Batman movies, I think Batman: Gotham Knight is perfectly capable of standing on its own two feet as a Batman animated feature, which Mask of the Phantasm unfortunately wasn’t able to. Batman: Gotham Knight was a welcome change of pace because it contained both what I love about Batman, and, despite being the stories being written by Americans from the WB staff, what I love about anime.